It was a big weekend for me and my partner in video gaming. Our goal was to immerse ourselves in Silent Hill: Shattered Memories, a “re-imagining” of the original classic PS1 game. I was totally looking forward to an update on the graphic experience of Silent Hill. What wasn’t appealing to me though was the use of the Wii controllers instead of a standard controller. I am not a fan of horror survival games that require you to wave your arms wildly. Plus, the Nunchuck is the worst video game controller ever. Just when a game is at its most demanding and challenging, the Nunchuck cops out. Every time. It just stops functioning and your character ends up walking in jerky circles while being attacked by some hideous creatures. And that was the case with Silent Hill: Shattered Memories. From the start, I was not all that enthusiastic about the game having NO combat system, just a Clock Tower 3 type of run and scream dynamic. 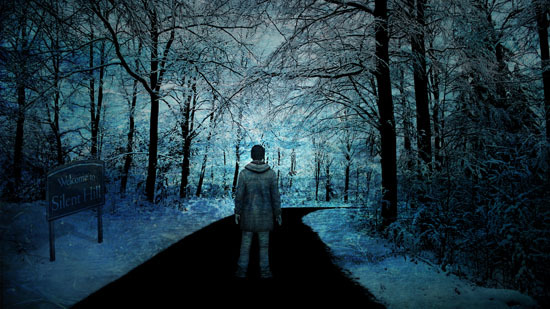 Initially, after the first minutes of the game walking around in the dark with just a flashlight and finding nothing to fear at all, we began to realize that until we entered the so-called “Nightmare” world, we were COMPLETELY safe, with no threats of danger (or chills and thrills). So we walked around collecting things, unlocking doors, and solving simple puzzles. As my video game partner prepped me for the coming of the first Nightmare world, I was nervous, but the game was forgivingly easy on us, with it being a short and pretty straightforward run with few monsters. See, what happens when the Nightmare world comes on is, the town suddenly turns icy blue (instead of rusty lava red like the original series), at which point you have ONE goal: escape the Nightmare world as quickly as possible without getting attacked and killed by monsters. Neon blue markers sort of guide you, but just because a door, fence, or path has a neon blue mark on it doesn’t mean that is officially the way to go! When we got to the much bigger second Nightmare world, it was all over. You can check the exit point on your map, but the map doesn’t show you the actual path or the obstacles that are going to detour you and throw you off course on your way there. So basically, the map is useless. What makes it even more useless is that, sure you can pull up the map occasionally (in real time!!!) to check your progress to see if you’re any closer to the exit, but doing so completely slows you down…and that is when the monsters come out of the dark and strike. They latch on to you and won’t let go. Having one on you is rather easy to shake off by swinging your Wiimote and Nunchuck in the direction indicated on screen, but when you get swarmed by three of them, the direction you are supposed to swing the controls differs for each monster depending on which side of your character they’ve attached themselves to, so you pretty much fail in getting ANY of them off! I was dying repeatedly and running in circles in an effort to stay away from the monsters, often ending up right back at the beginning of the Nightmare world instead of anywhere near the exit!!! Also, the environments are extremely dark in the Nightmare world unless you keep your flashlight turned on, but this is Silent Hill, so keeping your flashlight on in this hellish environment is the same as going to a football game wearing a cut-off shirt and Daisy Duke shorts. In both situations, you become a prime target for a beat down by a bunch of monsters. Another problem is the lack of any health gauge. You have NO idea how close you are to death, and even if you did, it wouldn’t matter because there are NO health packs in this game. That’s right. Nightmare world has one simple rule—either you make it out as quickly as possible or you die at the hands of the monsters. It was at the point when I was thrusting, pulling, and waving my controls frantically to shake off three monsters at once that my Nunchuck gave up, my character began the infamous uncontrollable meandering (with 3 monsters riding piggyback, no less) and I knew that this game was never going to be a scary-fun experience. 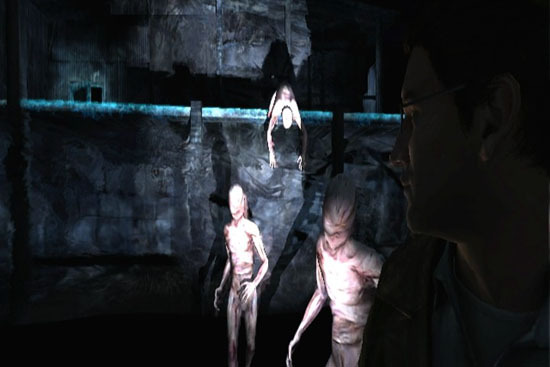 Silent Hill: Shattered Memories is simply an awful new way of playing a once classic and frightening series that was evenly paced but now has you skipping merrily along for stretches at a time before being plunged into five minute segments of infuriating hell. I even considered downgrading to the PS2 version of the game so I could play a port adapted to old school controls, but I read the reviews, and those horrible moments when you are attacked by monsters do not require you to shake the controller madly. Instead, the PS2 version uses always-annoying quick time events…if you don’t press the buttons in time, you die. HATE that. I was determined to get through the game since it’s so short and would have been the only game in the Silent Hill canon that I didn’t complete and keep in my collection, all on account of the “Nightmare” world. There are only six of these Nightmare world scenarios in total, so I had to figure out a way to beat the system. And I did…. The basic plot outline of the re-imagining is the same as the original. You are Harry Mason, you get into a car accident, your daughter is gone when you awake, and then you have to roam the town in search of her. Other than that, this re-imagining is completely rewritten. An interesting aspect of the game is the way your responses to questions and tests by your therapist to some extent affect what you see and do as well as the ending you get. You have a therapist in this game: a very distinguished and attractive man who can be somewhat aggressive in his analysis of you. If you are honest in your answers to his questions, at the end of the game you get one final reading of how he profiled your personality. It was very much on the mark in most cases for me. However, even though I spent most of my time on his couch just staring at his crotch, the game didn’t conclude that I was gay (although it will label you as a pervert if you stare too much at the breasts of any of the female characters during the game). So the game is entertaining the first time through, but it doesn’t seem worth a second play because it simply doesn’t deliver that constant edge-of-your-seat experience the original game did. The dread you feel throughout the entire original game is gone, replaced with the dread you feel having to get through the clumsy mechanics of the Nightmare scenarios. So how to smoothly get through these moments so you can at least complete the game once and learn the whole story? For starters, crank up the brightness on your television all the way. By doing this, when you enter a Nightmare, you can actually keep your flashlight off throughout the entire Nightmare without having any problems seeing where you are going! Keeping the flashlight off drastically reduces the amount of creatures that actually find you and chase you, which is a huge relief. Next, go to YouTube and search for a video clip of whichever Nightmare you are about to enter—the way to know one is coming soon is to follow an online written walkthru and read ahead to see exactly when you are close. Next, carefully watch the entire video clip of the Nightmare. If you are a longtime player of horror survival video games, you’re most likely good at memorizing environments and paths quickly, so the layout of the Nightmare will be fresh in your head when you move back to your Wii to start it. Next, have a navigator—a friend who starts the video walkthru just as you begin it and basically DIRECTS you as you run the path (“turn left into the next door,” “run straight to the set of double doors ahead,” “Climb the wall to your right”). You must communicate with each other, and you should basically repeat the navigator’s directions as you accomplish them so you know you’re both on the same page. This way, if the navigator’s video gets ahead of your progress or vice versa, the navigator can pause the YouTube clip or move it ahead a little to stay with you. Using this process, we managed to get through each Nightmare in about five minutes with barely ever a need to redo them because of a death. Sounds like fun, right? And there you have it. That’s how you cheat your way through Silent Hill: Shattered Memories so you can at least say you played it once. Now let’s hope that Konami gives up on this horrible new format of a classic series and returns to form on the next installment. Because if we get another game like this one, the series is as good as dead. 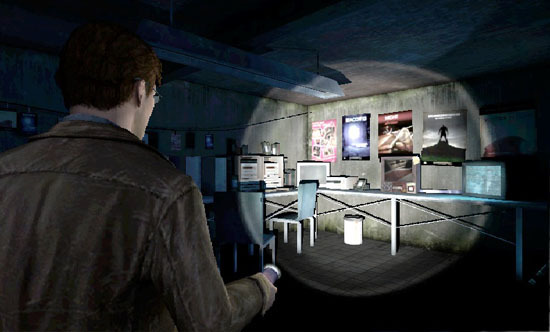 This entry was posted in The Evil of the Thriller - Everything Horror, What I'm Doing With My Joystick and tagged horror-survival, Silent Hill: Shattered Memories, video games, Wii. Bookmark the permalink.